Researchers at McGill University have discovered a new, more environmentally friendly way to make ketones, an important chemical ingredient in pharmaceuticals. While ketones are found in a wide range of useful chemicals, they are commonly prepared through energy-intensive, multi-step technologies that create significant chemical waste. In an article published online last month in Nature Chemistry, the McGill scientists demonstrate how carbon monoxide, a widely available by-product of combustion, can instead be used to form high-energy chemicals that react directly with benzene to generate ketones. “This approach could offer a new and green method to activate readily available, but inert hydrocarbons, and use them to make a variety of valuable products,” says McGill chemistry professor Bruce Arndtsen, senior author of the study. 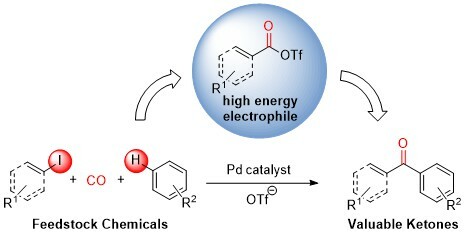 Funding for the research was provided by the Natural Sciences and Engineering Research Council of Canada, the Canada Foundation for Innovation and the Centre for Green Chemistry and Catalysis (supported by the Fonds de recherche du Québec – Nature et technologies).